Search Results for "plane inside"
UNITED STATES: 1970s: Pilot points to gages inside plane cockpit. Monitor showing air speed. Notice inside plane to 'raise flaps to increase brake effectiveness'. Lady and man talk inside plane. 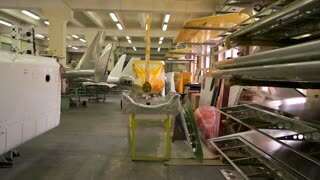 Inside an aircraft workshop. Components of planes. UNITED STATES: 1970s: Gages inside cockpit of small plane. Lady asks man a question inside cabin of small plane. Man adjusts altitude dial inside plane. 1940s: UNITED STATES: view of fields and clouds from plane. Man inside plane. Bombs dropped from plane. UNITED STATES: 1970s: Man shows lady flaps on wings of plane. Controls inside plane cabin move as man moves flaps on small plane. UNITED STATES: 1960s: USAF planes refuel in sky. View from inside plane's cabin. Plane comes in to land. Lights under plane. Early plane designs. UNITED STATES: 1960s: Flames and fire around USAF plane. Battle lights in sky. Pilot in plane. Medics at work. Plane takes off. Tank inside plane. UNITED STATES: 1990s: pilot and co pilot in cabin of plane. View from plane window. Delta plane in sky. Plane turns in sky. Dashboard and monitors inside plane. Interior passengers airplane with people on seats. Aircraft cabin with rows of seats. Passengers traveling by a modern commercial plane, inside of an airplane. Travel concept. 4K video. A still shot from an airplane's cockpit showing the beautiful sky and clouds from the outside and the dashboard of the plane inside the cockpit. UNITED STATES: 1960s: Pilot climbs down from fighter plane cabin. Pilot in locker room. Pilot inside fighter plane. Fast jet pilot in helmet. Trail from plane in sky. Planes in flight. Plane above ground. Europe 1940s: military planes in sky. Bombers, fighters, and dive-bomber planes in sky. Pilot inside enemy plane. English Channel Islands below plane. British convoys in English Channel. Close up of pilot's face in plane. 1970s: Man attaches cables to plane. Dummy sits inside plane suspended by cables. UNITED STATES: 1970s: planes lined up in row. Student and Trainer inside plane. Navy employees work at jobs. Navy students in classroom. Navy Officers dance at disco. 1970s: UNITED STATES: weather scientists inside plane cabin. Plane in sky. Clouds seen from plane window. Earth Science title.